Make a childhood dream come true and slip into a firefighting suit. 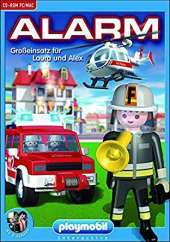 Help Playmobil characters Laura and Alex extinguish fires, assist the injured and prevent environmental disasters in this interactive and exciting game. 8 exhilarating missions await the junior firefighters. Complete with easy to understand instructions. 5 Detailed locations - Fire Department Headquarters. City Fire House, Cargo Docks and the Helipad. Promotes eye and hand coordination, concentration and observation.